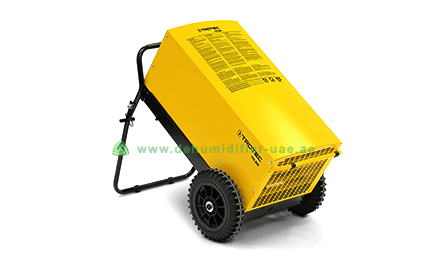 Vacker UAE supplies Warehouse Dehumidifier, also known as Commercial Dehumidifier in the UAE region. Our dehumidifiers come with highly powered compressors that are capable of dehumidifying large amount of moisture from the air. We understand the sensitivity of warehouses regarding humidity hence, we come up with the best kind of dehumidifier for our clients. Our products can be found in different parts in UAE such as Abu Dhabi, Ajman, Dubai, Fujairah, Ras al-Khaimah, Sharjah, and Umm al-Quwain. An Industrial Warehouse may have different types of items stored in them. High humidity can have adverse effects on such items. High humidity increases mold and fungus formation in items that are stored therein. Due to this, items made of cotton and leather are completely damaged. High humidity increases the rate of degradation in the quality of medicines which are stored in the warehouse. Humidity is also responsible for damage of food items which are stored in warehouses. The area and size of the warehouse should be properly calculated as the type of dehumidifiers to be used highly depends upon the size and area of the warehouse. If possible, temperature and humidity mapping of the warehouse should be done by professional experts. The products to be stored in the warehouse also should be brought into consideration. You must understand that different products require different humidity levels for safe storage. 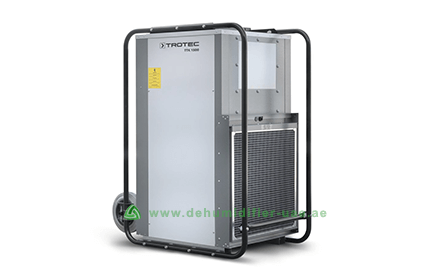 Generally, for temperatures above 10 degree Celsius it is better to use Condensation Dehumidifier while for less temperature it is better to use Desiccant Dehumidifier. During the purchase of Warehouse Dehumidifier, it is better to have knowledge about its maintenance. It can remove 300 liters of moisture from the air in a day. It has an air flow rate of 2200m³/hr. It consists of a cooling agent R-407C in its compressor. It can operate in temperatures from 0 degree Celsius to 40 degree Celsius. It is suitable for rooms as large as 340m³. It can dehumidify 475 liters of moisture from atmosphere in a day. It can operate in environment that has humidity ranging from 35% to 100% RH in a day. It can operate efficiently in temperature ranging from 0 degree Celsius to 38 degree Celsius. TTR 500D industrial portable dehumidifier. It is very easy to transfer from one place to another as it is very light is weight. It can operate in temperature ranging from -15 degree Celsius to 35 degree Celsius. It can operate in any kind of humidity level.